A pair of 12 page, black and white 5.5" x 8.5" zines bound by a full color double sided obi-strip. A project begun over a year ago, two friends on opposite sides of the globe decided to make some publications together. In Terence Hannum's contribution to "Epistle" his zine showcases recent pieces made by adhering the magnetic coating of old cassette tapes to paper and peeling off the mylar backing. These silent ghosts of obsolescent media are stratified into abstract and minimal compositions. 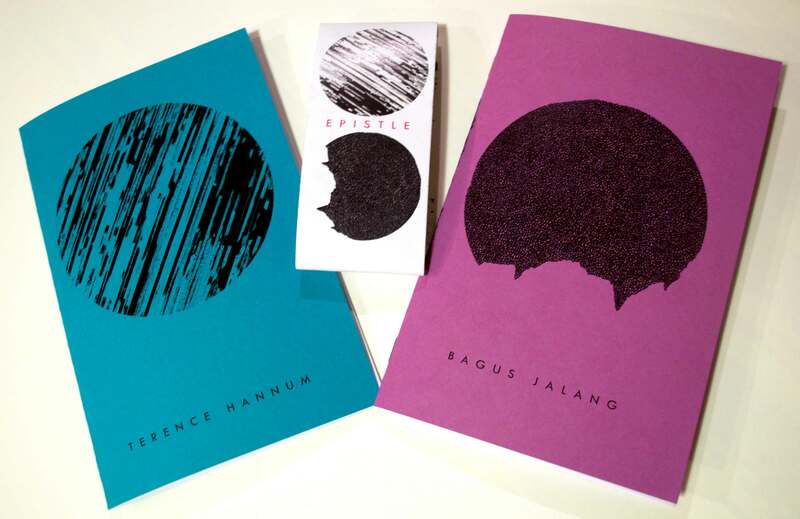 Bagus Jalang's contribution to "Epistle" consists of a zine of tediously drafted organic forms composed of small circles. The forms these meticulously drawn circles make resemble sections of earth, stalactites or other geologic formations all floating in expanses of negative space.